Gruel is a kind of food in the form of white pulp is eaten with a sweet sauce. Made from rice flour. These foods besides found in Indonesia also found in Malaysia. Here's how to make gruel a tasty and scrumptious. First create kincanya sauce. 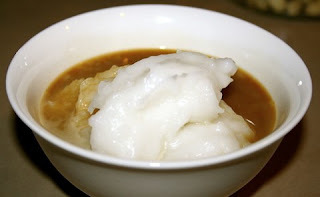 Boil all ingredients to boiling syrup of palm sugar and dough texture thickens, then set aside. Enter rice flour, coconut milk, salt and pandan leaves, and stir until well blended and the flour is dissolved. Cook using medium heat, stir again until mixture thickens and is smooth, then remove from heat. After the porridge has been cooked, put the porridge in a bowl that has been provided. Pour batter kincanya and gruel to eat and enjoy your creations. Gentle texture feels gruel once in the mouth. Accompanied with syrup of palm sugar sauce, making the taste more delicious. You can also use coconut milk for the sauce.